With my kids, the tradition of a special breakfast now spans more than one generation. When I was little, my mom always treated me like a little weekend queen. My Saturday morning would begin with an elaborate omelet, Potatoes with Lox, or a Russian French Toast, called Grenki – my absolute favorite! Unfortunately, because of my son’s severe egg allergies, eggs are not welcome in our house, so I do try to get creative with other tasty alternatives. Our new special breakfast is Almond Butter Kefir Breakfast Smoothie. This deliciously scrumptious shake, which is low in fat and high in protein and fiber, has become everyone’s favorite very quickly. It’s fresh, creamy, and sweet. It will satisfy your hunger for hours without causing you to reach for a snack. And most of all, it will deliciously trigger all the right taste receptors! Put all ingredients into your favorite blender. NOTE: If you use a blender frequently, I highly recommend investing in a powerful blender, such as Vita-Mix. I have had my Vita-Mix for over 11 years and it has been one the most used appliance in my kitchen – I use it to chop vegetables, cook soups (yes, cook, it spins so fast that it boils water in 7 minutes), make almond butter or ice cream, grind grains for fresh flour and even neat dough. Puree, until smooth and creamy. Add more kefir if needed to achieve the desired consistency. Sweeten to taste with honey. Pour into the serving glasses and don’t forget the straws. 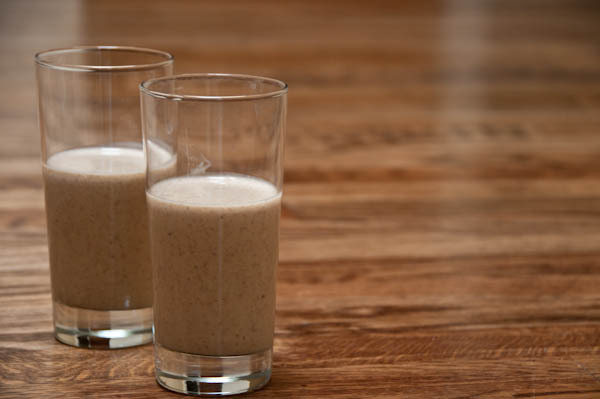 Another NOTE: Don’t let this delicious smoothie sit in a glass for too long; it tends to separate into layers, which is an interesting physical phenomena to observe, but with flax sunk to the bottom, makes the smoothie not so smooth. I also love using almond butter! It gives real flavour!! I love you appetizing picture too! MMMMMMMMM,..a great breakfast smoothy,..pretty & tasty too! Sophie, I am so glad you liked it! I used to love yogurt, then switched over to kefir. I just whipped this up and am enjoying it now. I mean REALLY enjoying it! Thank you for sharing! But the most precious original color version in the 2004 Athens Olympic Games was inaccurate because the U. You can choose the relaxed casual look of your typical beach sandal or go with a more formal yet casual look. of cash on a pair of genuine Ray-Ban Clubmasters. to glass sheet. This means that homeowners won’t have to move aroundtrees, flowerbeds or other ornaments, which would be obscured fromview by non-glass fences. and can help retain heat in homes. You can buy either translucent or transparent acrylic plastic in sheet form. none-porous material so will wipe clean very easily. strips, have students place the words in alphabetical order <. of the lower end unsealed for drainage.